I have collected and studied relics for over 40 Years, Collecting since childhood. I specialize in the following regions: Arkansas, Oklahoma, Missouri, North East Texas, Louisiana, Western Mississippi, Western Tennessee, Western Kentucky, Indiana and Illinois. But, I collect and appreciate relics from all states. I have appraised collections, and owned over a half million relics from this area. I also specialize in the following cultures: The beautiful Arkansas, Northeast Texas, Louisiana and Oklahoma Caddo Relics consisting of Flint, Pottery, Stone and Shell. 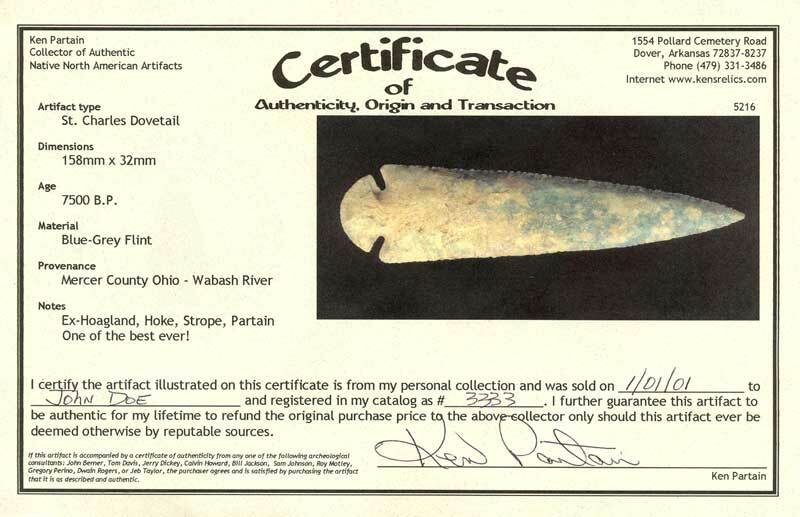 I also specialize in the following flint areas: Northeast Arkansas and Southern Missouri Crowley's Ridge Flint including the most beautiful Clovis, Dalton, Hardin, and Cache River points made by ancient man. Well Made Arrow Points of the Caddo Culture, Hayes and Agee Points. Also beautifully made points from Arkansas and well made Paleo flint and large Dalton points from that area. Certificate are provided with all artifacts from my collection and guaranteed for my lifetime to be authentic. Many artifacts include certificates from other authenticators, along with my certificate of authenticity, transaction, and orgin. Some have 2 and 3 certificates. Arrangements can be made for us to send to any third party authenticator of your choice, and the fee added to the cost of the artifact. Artifacts shipped on approval are returnable within 10 days, along with the certificate that accompanies the artifact if the collector is not satisfied. Every effort will be attempted to provide a smooth, satisfactory, authentic, and reasonably priced transaction for collectors to add quality artifacts to their collection. My 35 years of collecting and dealing with other collectors will be the best guarantee available. References are available upon request. We proudly accept Cash, Check, Money Order, Visa, MasterCard and Paypal. Relics can be shipped for approval to known collectors only! Payment plans can be arranged for known collectors for more expensive relics. I pay the shipping and insurance to you, You pay when you send me relics so I am assured I am buying good, authentic single relics or collections.